ENUGU — South-East governors appeared divided, yesterday over the ongoing pro-Biafra Republic protests. While Imo and Ebonyi states kicked against the protests, Abia State remained neutral, while Anambra State said it was studying the developments. Also the umbrella body of Igbo socio-cultural organisations, Ohanaeze Ndigbo and Imo State Governor, Owelle Rochas Okorocha have distanced themselves from the ongoing protests in the South-East for the actualisation of Republic of Biafra, saying all genuine Igbo leaders are against the protests. Okorocha, who is also the chairman of All Progressives Congress, APC, Governors’ Forum, said that the reported violent protests in some states’ capitals, including those of Rivers, Anambra and Delta, in the name of Biafra, do not in any way have the support or blessing of the governors and leaders of the South-East geo-political zone either directly or indirectly. 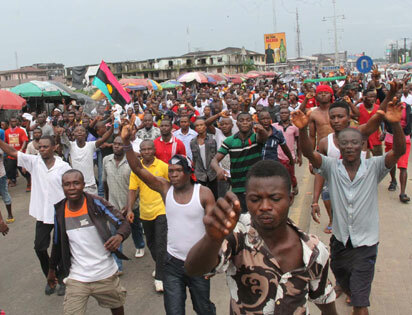 Meantime, the Biafra protests continued, yesterday, in Aba, Enugu and Port-Harcourt. Okorocha said: “The ugly development is highly regrettable especially when it is clear that such violent protests in the name of Biafra wouldn’t add any value to the development of the South-East and the progress of the people of the area.” Continuing, Okorocha said that the governors and leaders of the South-East condemn the protests, especially when they were carried out in the name of Biafra. According to him, the South-East remains an integral part of Nigeria and the governors and leaders from the area so much believe in the unity of the country and would always work towards sustaining the unity. “As far as the governors and leaders of the South-East are concerned, those behind the campaign for Biafra have their ulterior motive, which has nothing to do with corporate interest of Ndi-Igbo in Nigeria of our collective dream”, Okorocha reasoned. While saying that the concern of the governors and other South-East leaders “is to get what is due for us in our country”, he added that any other quest, especially for Biafra was diversionary. He called on those behind all the protests on the basis of Biafra to give peace a chance and regretted that some Igbo people could get involved in a protest that its end – result won’t benefit Ndi-Igbo in any way, but could lead to the shooting of some of them. “The unity of Nigeria is not negotiable, and the South-East people strongly believe in that unity and would work assiduously to ensure its sustenance”, Okorocha said. Echoing similar views, Ohanaeze said those sponsoring the latest agitation for the creation of the state of Biafra are corrupt Igbo politicians who are trying to hide under the agitation to avoid prosecution for their alleged crimes. In another development, former Biafran leader and Ikemba of Asaba, Delta State, Chief Joseph Achuzia, has berated former President Olusegun Obasanjo, for describing pro-Biafra agitators as miscreants, saying he is a kettle calling the pot black. In an interview in Asaba, Achuzia said: “This is a question of the kettle calling pot black. The ex- President, Olusegun Obasanjo, is a friend and I have the greatest respect for him, but unfortunately, half or most of the times, he, out of arrogance becomes careless in the words he uses. “Where in the world would you see that in a democratic set up, when they are changing batons after elections, they still have a military composition where a president or person elected will run the country by himself for almost six months as a military dictator and nobody is questioning it? But like I said, I like the present leader’s style because it is what the people asked for that they got,” he said. On the renewed agitation for Biafra, he said it was because nobody has addressed the issues that led to the war. The protesters in Enugu, who were clad in Biafra red and black colours, marched through major streets of Enugu metropolis chanting anti-Federal Government slogans insisting that the Directorate of State Service, DSS, should quickly release Nnamdi following the fulfilment of his stringent bail conditions by his Lawyer, Mr. Vincent Obetta. They were, however, peaceful as motorists were allowed to ply without any confrontation. When contacted over the telephone, Nnamdi’s lawyer, Vincent Obetta said: ”I got a call from Police authorities asking why my client should call people out on the streets for demonstration. This is happening in spite of four court orders I have secured and served to DSS instructing them to release my client who was granted bail since October 19. 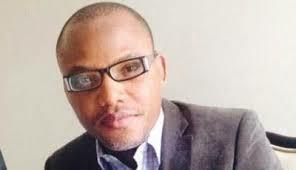 “DSS has not given any reason for his continued detention. We have fulfilled his bail conditions. To worsen the matter,he is being detained in DSS facility instead of prison custody with access to his lawyer and personal physician. Nnamdi is being detained by an executive order. Its is a clash between judiciary and executive. “I have not seen or heard any place where a court grants bail and the person is not released. Under UN and Africa charter, it is enshrined that once bail is granted, you release the person upon meeting the bail conditions. We are sliding to days of Decree 2 and 4 of 1984. This is pure dictatorship.” In his reaction, the Police Public Relations Officer, PPRO, Mr. Ebere Amaraizu, in a text message to Vanguard said that,”MASSOB declared a non-violent protest in Enugu. Security operatives are monitoring closely to ward-off violence and suspected cashes in the protest”. Meanwhile, when Vanguard drove round the streets of Enugu metropolis, there was unusual military presence at strategic locations even as armoured tanks were deployed to the streets ostensibly to forestall possible breakdown of law and order. In Abia, a cross section of members of the group said that they decided to embark on the protest as a mark of respect for their leader, Kanu who is being detained by the federal government and called attention on the marginalization meted out on the South East and South South zones of Nigeria. According to them, “we want to use this opportunity to tell the world of the level of marginalization and dehumanization the South East and South-South states have suffered even when they were the goose that lay the eggs other parts of the country are enjoying today.’’ They called on the International bodies to help them realize a sovereign state of Biafra which they have been agitating for. The group had as early as 7am gathered at a location near the Ariaria International market to take off for the protest, but were dispersed by a combined team of security agents. Between 11am and 12noon, the group went round some lines in the Ariaria International market with a bell warning that the market would close for business on Monday for a proposed rally. But according to a member who later spoke to Vanguard, it was a ploy to deceive agents of security agencies who were acting as spies in the market. While marching along Ikot Ekpene Road, the group made a stopover near the office of the Nigerian Television Authority, NTA Channel 6 Aba, but were not allowed to get close to the gate of the television station by the police. Spokesman of the Abia State Police Command, DSP Ezekiel Udeviotu Onyeke, could not be reached for comments; a senior police officer at the Aba Area Command told Vanguard that the Police were on ground to maintain law and order. Motorists and passengers were stranded last night in Obiogbo area of Rivers State as hundreds of pro- Biafra supporters embarked on protest march. Some motorists and passengers who called Vanguard at about 7.15pm last night said there was no vehicular movement around Timber bus stop area because of the activities of the protesters. “Vehicles can’t move, commuters are stranded at Timber bus stop because of the protesters. It is really difficult here”, a lady trapped at Timber bus stop told Vanguard on phone. It will be recalled that similar protest held at Okobe community end of the East West Road in Ahoada West local government area of the state on Saturday. Effort by the Rivers State Police command to ensure the protest did not hold in the state was futile as the protesters beat Police security to embark on the exercise. There have been heavy Police presence in Port Harcourt, the state capital to nip any protest by the group in the bud. In a related development a soldier allegedly shot dead a commercial bus driver around Rumuokoro area of Port Harcourt, yesterday evening, for reportedly driving against traffic. Details were hazy but the situation caused traffic gridlock in the area as some commercial vehicle operators went on protest. Eye witnesses said the protesters blocked the road for some hours before calm was restored. Anambra State government said last night that it is still studying the activities of the pro-Biafra agitators, who have caused some disquiet in the state in the last few days. The agitators, mainly those belonging to the group known as the Indigenous People of Biafra, IPOB, brought the commercial city of Onitsha to a standstill, last week, while another group travelled from Agbor in Delta State to Awka where they caused traffic gridlock for several hours on their way to Ebonyi State. A government official who spoke to Vanguard on condition of anonymity said that Anambra State government was handling the matter with a lot of caution. He said that since the agitators have been peaceful in their actions, there has not been any need to use force on them. He however warned that the state government would not watch while they threaten the existing peaceful atmosphere in the state. While in Awka weekend, the group, chanted pro Biafra songs and demanded the immediate release of the embattled director of Radio Biafra, Mr. Nnamdi Kanu. They were led by the Lagos State coordinator of IPOB, Mr. Raphael Ikedigwe, who insisted that they would continue with the peaceful protest until Kanu, Benjamin Onwuka and others in detention are released. According to Ikedigwe, members of the group were divided into two, comprising group A made up of those from Bayelsa, Rivers, Abia, Imo, Akwa-Ibom and Cross river states, while group B comprised of Anambra, Imo, Enugu and Ebonyi. The group said they were different from Movement for the Actualization of the Sovereign State of Biafra (MASSOB) although they are pursuing the same agenda.